Mega Brontes is the evolved version of Brontes, and is twice his original size. With his new metal-plated armor he can withstand multiple blows during battle, and his clawed hands grip a battler like a vice. 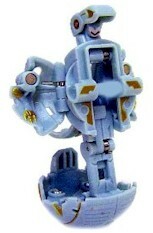 He is now one of the quickest Bakugan, which makes him difficult to capture. Purchase Mega Brontes from Amazon now!